What can assist youth in overcoming the drive to avoid reaching out to others and feel fully connected in a relational way? Who are the youth who are more likely to reach out? 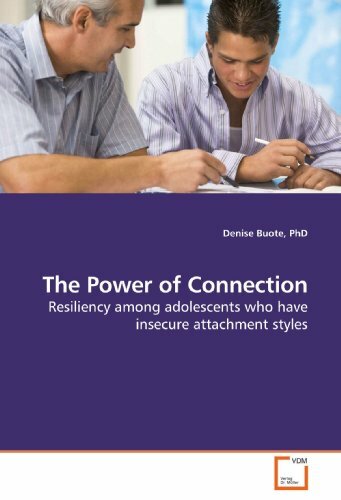 The present study provided a unique window into the relation of attachment avoidance and attachment anxiety to dimensions of resiliency among 94 adolescents living in a large Canadian urban centre. Although these youth came from backgrounds that emcompassed a great deal of life stress, findings revealed significant differences among these youth. Specifically, adolescents who can be characterised as stress- resilient scored significantly higher on dimensions of relationships with adults, optimism and number of adults identified as being important in comparison to those who are more stress-affected. Additionally, stress-resilient adolescents scored significantly lower on the attachment avoidance. Together, these findings have important implications for the way in which we can engage youth in growth promoting relationships.